The Deco Piano Trio takes its name after the Art Deco movement which combined modernism, cubism, and abstraction with elegance and a belief in social progress. Breathtaking Deco architecture can be found across the world, from Paris’s Folies-Bergere to Tokyo’s Diet Building to the crown of New York City’s Chrysler Building. Art Deco was perhaps the first style of art to be truly internationally unified; members of the trio are from Taiwan, Sweden, and the United States. 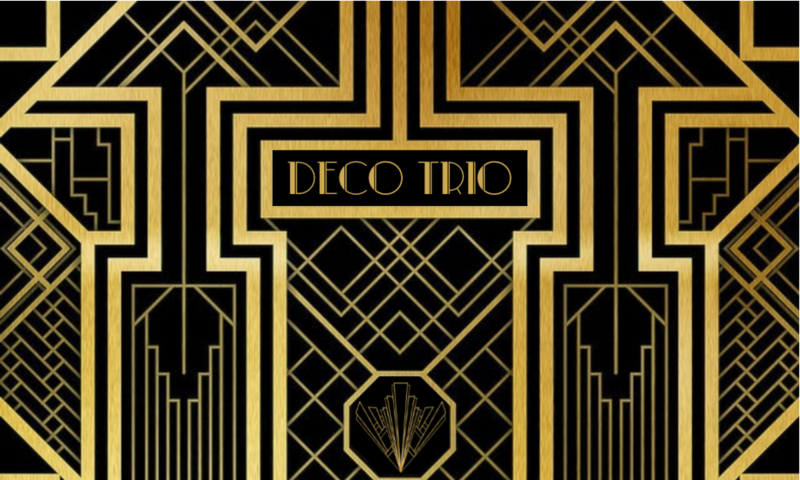 The Deco Trio recently appeared in Vermont, Wyoming, Michigan, and Arizona. The 2017-18 season includes trios by Beethoven, Piazzolla, and Brahms, and the Triple Concertos by Beethoven and Martinu. The Deco Trio is Chi-Chen Wu (piano), Gregory Maytan (violin), and Theodore Buchholz (cello). These artists are from the faculties of the University of Wyoming, Grand Valley State University, and the University of Arizona.